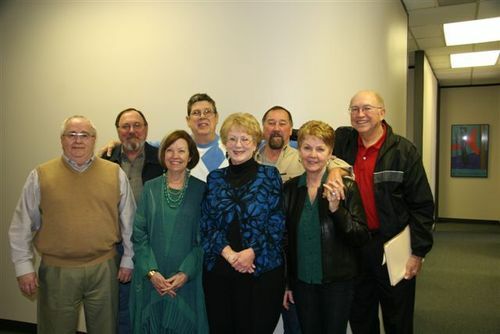 Ray writes: "The committee got together at Larry Pyle's office on Saturday, February 27 to start calling classmates. We were trying to make sure that people had received their snail mailed copy of the Reunion Announcement. We are trying to prevent the last minute rush of registrations by encouraging people to send in their reservations form as soon as possible. Here is the committee as we were finishing up the calls from that office. Everyone took a stack of data sheets, one for each classmate, and are continuing to call those remaining people."